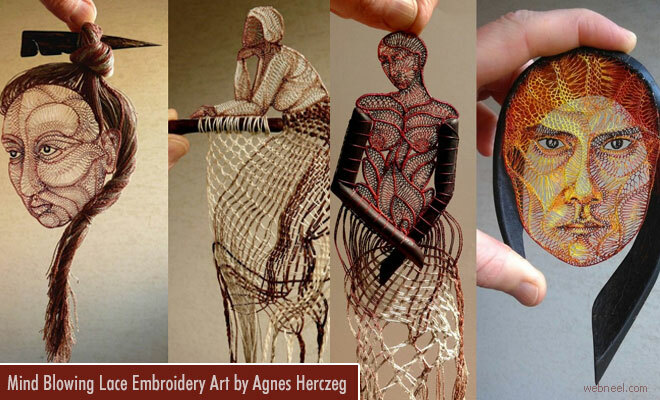 Lace Embroidery Art: Agnes Herczeg is a talented artist from Hungary. She graduated from the Hungarian University of Fine Arts (1992–1997) majoring in textile conservation. She has a creative hand for handicrafts. She uses only natural materials of vegetable origin like yarns, threads, textiles, tree branches, roots, fruits and seeds. Apart from lace embroider art she is quite talented in needle lace, pillow lace, macrame, braiding and so on. According to Agnes Herczeg, "I often make the moulded parts of my pictures from ceramic material. I combine various techniques in my works, thus traditional handicraft is complemented with natural wood and ceramic material to form the image". Lace embroidery art involves a lot of physically and it takes several days to finish a small piece of art.